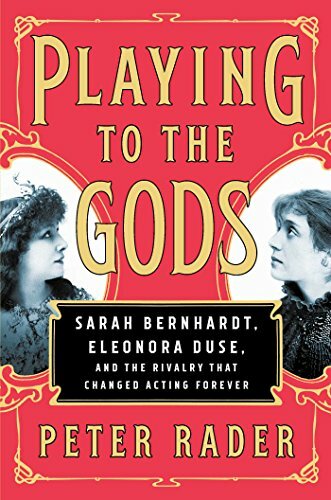 Peter Rader’s Playing to the Gods, chronicles the lives of the two leading ladies of late 19th-early 20th century theatre, Polish-French Sarah Bernhardt (1844–1923), and Italian Eleanora Duse (1856–1924). These divas were stars throughout the Western world even though they performed in languages incomprehensible to many in their audiences. Their rivalry was sparked by the fact that they often performed in the same plays, particularly Dumas’ La Dame aux Camelias. Both stars barnstormed the United States, sometimes in giant tents since few theatres could hold their adoring audiences. Duse died while on tour in the U.S.
Rader focuses on the contrasts between these two artists whose careers flourished at the same time. Bernhardt and Duse were celebrated even though they had very different acting styles. Bernhardt was the mistress of the old school of acting, filled with statuesque poses, grand gestures and stentorian vocal delivery. Everything was larger than life befitting the enormous theatres in which she often performed. Duse employed a more “modern,” internal style of acting. She disobeyed all the old rules, often turning away from the audience for a private moment, pausing in thought, and employing sotto voce effects. Duse refused to wear makeup so her subtle facial expressions would “read” more effectively. There was a complexity and mystery in her performances missing in Bernhardt’s. Rader rightfully presents Bernhardt as one of the first grand theatrical celebrities, a predecessor of stars like Streisand, Madonna, or Beyonce. Her offstage performance was a grand as her acting. Like her mother, she had been a prostitute in her youth and was very open about her many lovers. Bernhardt was as adept at seducing men, particularly men who could be of use to her, as she was in seducing her audience. Duse kept her private life to herself. During her first American tour, she didn’t want to meet with the press. She existed only on stage. Later, partly to compete with Bernhardt, she became more of a public figure. Her one highly publicized romance was a troubled one with Italian poet and roué, Gabriel d’Annunzio, who was willing to live off of Duse’s earnings but not be faithful to her. Both women were known for their political positions. The Jewish Bernhardt became a highly controversial when she ardently defended Captain Alfred Dreyfus, a Jewish soldier accused of spying. Her stance only intensified the expressions of anti-Semitism she experienced throughout her life. Yet she became a national hero through her patriotic performances during world War I. Duse, as one of the most famous representatives of the new, unified Italy, was given a state funeral after her death. Duse and Bernhardt did not meet often. Bernhardt often made a grand, generous gesture toward her younger and somewhat less celebrated rival. She even offered Duse the use of her theatre in Paris. They were, however, first and foremost, rivals. The sickly Duse only gave a few performances a week. The hardy Bernhardt even found ways of performing after she lost a leg.